Hello warriors! Welcome to this new entry in our State of Balance posts, where we analyze results from the past season and where we are headed in the future. Season 7’s “Storm and Fury” update introduced several changes to the game. Let’s go over them. Warden improvements – Warden received significant flow improvements, as well as a Shoulder Bash buff. These changes seem to have helped Warden’s win rate. Valkyrie improvements – Valkyrie also received a large chunk of changes to her kit, most notably to Shield Crush as well as her chains. These changes have had an effect on her and seemed to have helped her climb upward in the ranks. Switch Stance bug on non-Reflex Guard heroes – In our mid-season patch 1.27, we fixed a Switch Stance bug on non-Reflex Guard heroes, which would incorrectly skip the 100ms to Switch Stance if the input was performed immediately after another Switch Stance action. This had a significant impact on Assassin effectiveness (as we have seen in the Season 6 recap). With the issue now resolved, Assassins have become more viable at top levels, as hoped. We’re changing up the way we’re sharing data for 1v1 matches. In previous State of Balance posts, we used to pick the top 2.5% of players in 1v1. 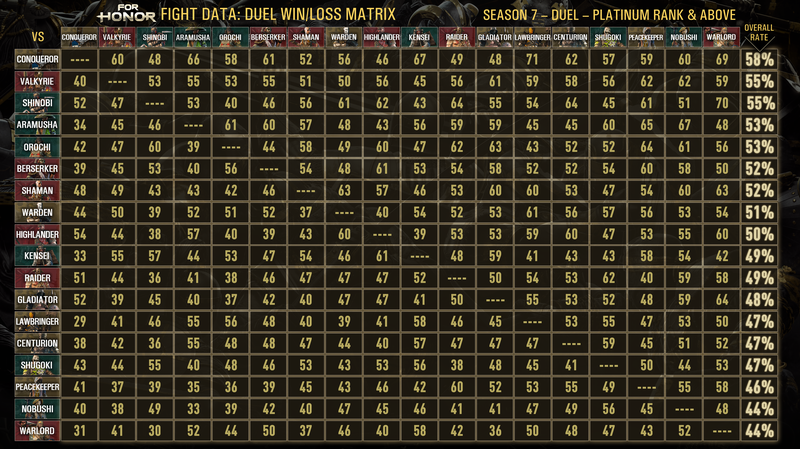 Players have been asking for tighter 1v1 data at even higher levels of play, and with the introduction of Master and Grand Master ranks in Ranked Duels we can focus on that dataset. We’re hoping this will be more representative of the top players, especially since we will now only be picking Ranked Duels (PC and Console data combined) instead of all Duels. This gives us a much more narrow view of the data – the theory is that Ranked matches are approached differently by players as they are taken much more seriously than unranked matches. For 4v4 game modes, we are keeping the previous way of looking at the data (top 4% of players). Another difference this season is that the data we are sharing starts at patch 1.27 instead of the start of the season. The reasoning behind this change is that the Switch Stance bug was fixed in patch 1.27, and we feel this represents the actual data better. In general, Assassins jumped up 3% in their win rates when we exclude data prior to patch 1.27. This bump is significant enough to justify looking at the data from later into the season. Below is a matrix of 1v1 Duel matches played by Platinum, Diamond, Master and Grand Master players during Season 7 for PC and Console combined, from patch 1.27 onwards. Valkyrie is placing in very high in Win Rate and is on the higher end of the Pick Rate. These numbers are most likely due to her improvements, and it will be interesting to see where she settles in the coming seasons. Shinobi and Orochi, while not having received any direct buffs, land high in the Win Rate due to the fix applied for the Switch Stance bug. Warden’s pick rate is sitting above 20%. 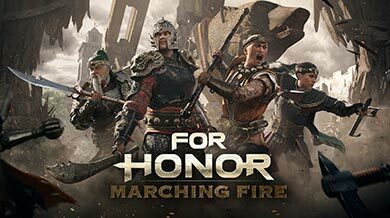 Warden’s pick rate has always been historically high, and we’ll see where this settles in the coming season with the new Wu Lin characters that will most likely have an impact on Ranked Duels. Here is the top 4% of the 4v4 Dominion For Honor Players on PC and Console combined during Season 7, according to our skill rating. (All players in the match need to be above the skill threshold to consider the match, no rank matches are included and the data is taken from patch 1.27 to the end of the season). The top 5 for win rates remains essentially the same, with a little bit of shuffling around. We are hoping that the introduction of the Wu Lin will help shake things up a bit, and will continue to monitor the situation. 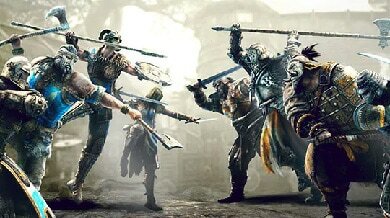 The Switch Stance bug did not affect Dominion as much as Duels – Assassins are generally in the same position and win rate as they were before. What does this data mean to us? Most Assassins are back to where they were previously in terms of win rate in Duels – fixing the Switch Stance issue really made a big difference to them. Most of them jumped up 3% in win rates in Duels, which seems correct. Peacekeeper is still tracking rather low, both in Duels and in Dominion, and we are looking into improving her with a damage buff. Shugoki is also tracking low in all game modes and we are looking into improving him. IMPROVING OFFENSE. Globally offense is still a bit too weak at high-level play. We’d like to see moves such as each characters’ “light openers” do a bit better of a job at actually opening up opponents. REVENGE GAIN IN 1v1 SCENARIOS. Within the context of a 4v4 game mode, the ability to gain Revenge while in a 1v1 fight impairs the ability of many heroes to successfully fight and kill opponents, because the opponent is likely to enter Revenge before dying. LOCK TARGET ISSUES. Currently, when you’re outnumbered by more than 2 opponents it can be very difficult to lock onto the opponent you want - usually you end up cycling between the same 2 opponents. Improving this would be a benefit for players in group fights. 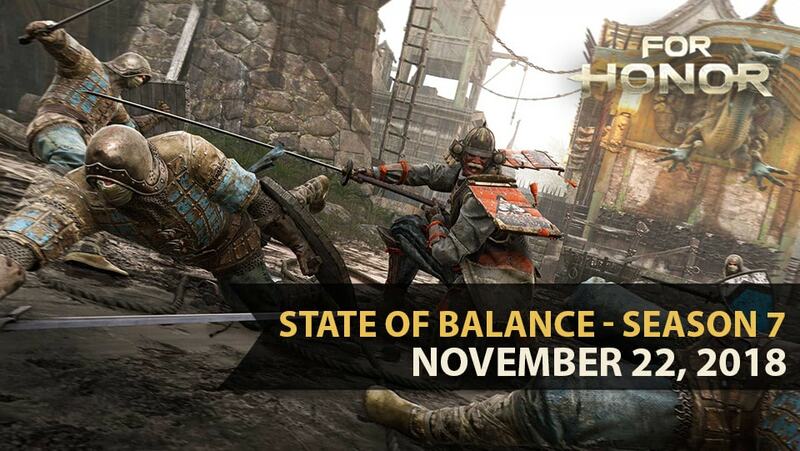 Keep sending us your feedback, and we look forward to the sharing the next installment of the State of Balance at the beginning of Season 9! After isolating an issue, we work on it until we think we have a good solution, we test it internally and sometimes even externally, and then patch it into the game. The length of the process can vary a lot depending on the issue and the solution involved. For example, some solutions can be addressed via data in a Live Update, which offers us some flexibility for release timing, where others have various dependencies or require code changes in a full Title Update (Patch) which requires much more complex production timelines and submission processes.